I still remember the first glance into curious azure eyes and passing my fingertips over downy blonde hair. The first swaddle, the first suckling, first words, first steps and first day of grammar school. Although the youngest of five, the experience was still fresh, new and exquisite. There are blessed occasions still, when I hover between the veil of arising and sleeping, when I can inhale the pure scent of baby breath….a remembrance that makes me smile. 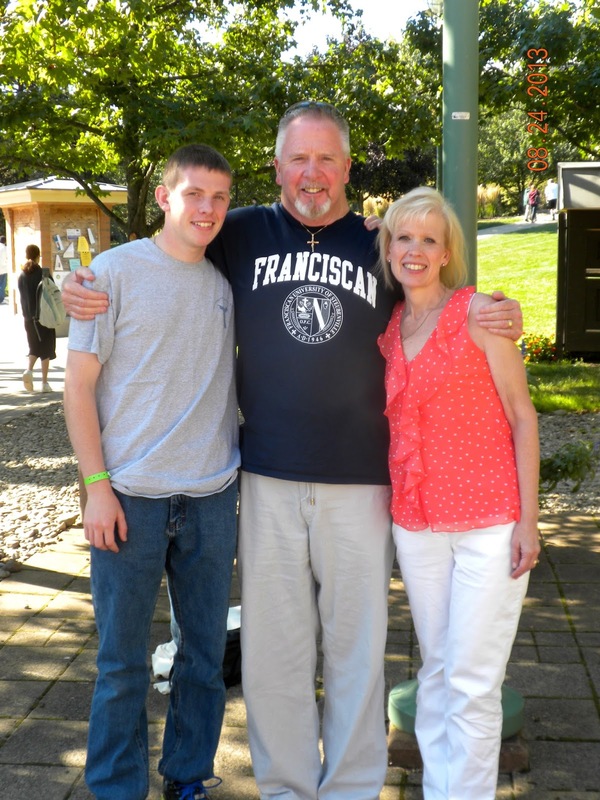 It isn’t something that I dwell upon, but those memories and more brushed against my heart as my husband and I dropped our son off to college for the first time this past weekend. Today the silence is so… well. quiet. It isn’t easy to let your youngest leave the nest. The fear creeps in and at times overtakes rational thinking! Will he eat? Will he find friends? Will he get good grades? Will he do stupid things? When he was home, I could drill him on all aspects of his life; a type of “Irish Inquisition,” I would joke to my husband. Generally, Erin would succumb, but the past few weeks, I have noticed a strange silence and reluctance to share. Perhaps he was preparing himself…….or us for the vacancy. A friend recently told me that while in prayer, God told her that she did her job to fill the empty glass with water and now it was His job to replace that water with wine. The words struck deep and helped me to accept that Erin was never mine at all. While he occupied space in my womb and captured my heart, he, like the four before him were gifts to prepare for the Maker and it was my task to offer them back at the appropriate time. To the best of my ability, I have tried to fill that glass with pure, clean and sweet water, and he has shined like beams of light through a crystal on a sunny day. While no one is perfect, Erin has always strived to live a Godly life, caring for his parents, empathizing with our many struggles, helping at home, doing well in school, and working hard to be the best son possible. The worries never end; and if you don’t believe me, ask my four grown children and they will concur…but I have learned to let go and to give them the space they need to become what God wants them to be. They have each shined and grown into remarkable adults and parents. It is so obvious that God has indeed replaced the water with wine. It is challenging, this new stage of my life and admittedly, a bit lonely and I am feeling as if I lack a sense of purpose. This struggle is not new, but resounds a bit louder today. We are all works in progress and now that the nest is truly empty, perhaps it is time for me to see what God wants me to be. And maybe He can fill my glass with wine too. This entry was posted in Catholic, college, empty nest, faith, Jesus, water, wine. Bookmark the permalink. What a most beautiful expression of a mother's undying love. You are a precious person and Erin is so fortunate and blessed by God to have you as his Mother. Erin is in love with God. God will let Erin be free, but God will also keep him safe under God's loving protection. Your writing has turned glasses of water into glasses of wine Karen. Thank you for all that you are. Thank you so very much! I appreciate your kind words and encouragement! Although not much of an imbiber, I gain a renewed appreciation for Christ's first miracle–interesting that it was His first! Though I'm not much of an imbiber, I gain a renewed appreciation of Christ's miracle–interesting that this was His first!